Aguirre‘s physical world is so vividly tangible that it permeates the film. Herzog’s remarkably astute eye for landscape–not unlike his ear for music—is informed by a reverence that is almost otherwordly. Like other masters of landscape—Leone, Mann and Antonioni, to cite three obvious choices–his landscapes serve functions that are both literal, (as physical arenas for the action), and metaphoric, adding texture and resonance. And Herzog’s later rantings notwithstanding, his understanding of the jungle goes far beyond seeing it as intrinsically hostile to humans. Indeed, Aguirre‘s jungle offers its native inhabitants both homes and sanctuary from the murderous invaders. But his jungle, majestic and ineffable, is implacably hostile to invaders seeking to master of subdue it. And a central element of the expedition’s deluded hubris is a belief it can overcome, and if necessary, subjugate, the natural world. (Aguirre, styling himself the “wrath of God,” boasts of his power to make birds fall dead from trees and make the earth shake; an Indian compares the invaders to natural disasters.) Thus the expedition party is almost suicidally oblivious to its precariously marginal place within the natural order. The defining aspects of the setting—its overwhelming scale, the river’s menacingly churning rapids and endless calm stretches, the mountains’ precipitous slopes, the endless mud of a jungle “trail,” the jungle’s verdant impenetrability, are lost on the Spaniards. They experience the landscapes as almost interchangeable manifestations of the natural world’s hostility. Of course, the subject of conquistadors implicitly connotes the destruction and devastation of imperialism. In one evocative sequence, a slave recounts his former status as a great prince, so powerful his subjects dared not even look at him directly; as he speaks, his head is turned away from his listeners, his status so diminished that he cannot look directly at the camera. The loss in status powerfully evokes the political and cultural devastation of conquest. The expedition is presented without “heroic” trappings. Even the Spaniards’ prowess in fighting and slaughtering Indians gets little emphasis: a native falling by the wayside, a soldier prodding a reluctant porter, an occasional manacle on a slave are virtually all the film actually shows of subjugation and slaughter (though the narrator speaks of the Indians “dying like flies.”). Instead, the film shows the expedition confronting the jungle, lacking the power to do more than generate empty sound and fury. As they pass through the jungle, the invaders leave no marks on either the land they are purportedly conquering, or the river that capriciously controls their progress. The Spaniards’ powers to destroy—killing, pillaging, (and betraying)—extends only to their fellows: when the Spaniards shoot at each other, men are killed or wounded; when they shoot at the natives in the jungle, the shots are futile, harmless, lacking even targets beyond the jungle itself. Even the ostensibly destructive act of burning Indian villages is futile: the first fires are set by natives, and their effect is to deprive the Spaniards of plunder. This leaves the invaders, effective neither as predators nor destroyers, as little more than victims of the jungle. Much of the film’s force comes from its rigorous control over point of view. This is most obvious in the narrative’s insistent focus on the expedition, as it unravels and Aguirre deteriorates into madness. That deterioration is all the more striking because he initially seemed more rational than his fellows: his first words acknowledged it would be impossible to survive a raft trip down the river, he showed a touchingly human solicitude for his daughter and he later refused to let the expedition be drawn into the point­less chore of burying the dead in “consecrated ground.” But as the expedition proceeds, he becomes an increasingly solitary figure, his deranged eyes blazing; as he swaggers he seems to lean back away from his surroundings. By the end, his lunacy is both active—as he declares himself the “wrath of God”—and passive, as he fully joins the expedition’s collective madness. 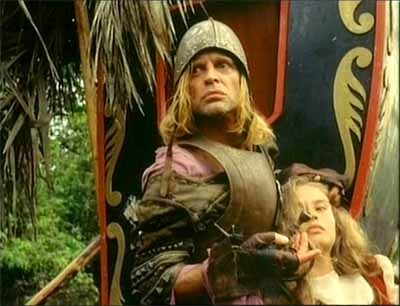 The ascendant lunacy is, of course, heightened by Kinski’s histrionic performance—his first for Herzog—in the wild expressions on his craggy face and the fire raging in his electrified eyes. 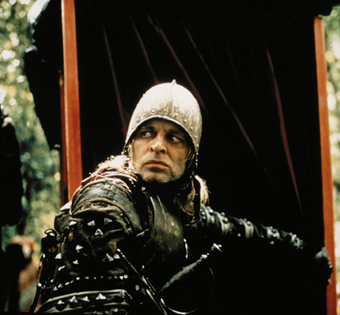 Kinski re-traveled much the same ground in later Herzog films, moving close to shtick, but here he invests the developing persona with chilling intensity. Another facet of the limited point of view is what the camera shows: with the single exception of the opening shot of the clouds, the film invariably either looks at the expedition or looks out at the world from it. As a raft trapped in a whirlpool drifts hopelessly in an unbreakable circle, the camera keeps its distance, showing no more than what the rest of the expedition sees; after dark an attack on the trapped raft registers only as a series of gunshot flashes in the darkness. Only when a rescue party reaches the rocks above the raft does the camera finally draw closer. The detachment links viewers to the expedition’s desperate helplessness, passively watching as the doomed comrades perish. Later, as a woman leaves the expedition, the camera follows her until she comes to the edge of the group, then pivots and stops, to watch her disappear into the jungle. It stops moving with her and begins to observe her when she leaves the group. And the natives on shore, aside from a couple that boards the raft, are shown only from a distance, invulnerable if not quite invisible. The camera’s—and the audience’s—identification with the expedition becomes most explicit when spears from the jungle fly directly toward the camera. The limited point-of-view also amplifies a sense of the mysterious and unseen that is almost palpable. Even gunshots fired during Aguirre’s mutiny seem to come from nowhere, first registering audibly, as disembodied sounds, and then visually, as bullet wounds appear on the victims. At other times, spears, arrows, or darts materialize on the screen, as if propelled by unseen forces. This is the converse of the Spaniards firing into the jungle with no visible targets, and hence no hope of hitting anything. The sense of disconnection and isolation becomes overwhelming during an interlude when the sounds of the jungle cease. The men, now separated even from the sounds that, link them to the jungle, become crazed and terrified, making noises simply to break the silence. But the jungle remains impassive, indifferent to the sounds of gunshots or the reed music of an Indian or the tongue-singing of Aguirre’s most vicious henchman, or Aguirre’s psychotic ramblings. Natives in the jungle see the expedition as food passing by. 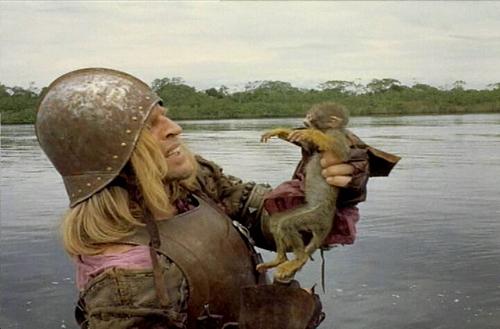 When Aguirre proclaims his wildest dreams of conquest, he cannot even repel the monkeys who have overrun the raft. The invaders are no more than a link in the food chain, bits of matter whose death will feed and increase the rot and regeneration of the jungle. In the film’s final shot, the camera envelops the raft in a circle, a small point of space within the vastness of the jungle, where man is a passing nuisance, no more consequential than the arrows that so easily separate him from life.